Preventative maintenance grooming is not only for dogs who require "inbetween" regular grooming, it is also to maintain healthy skin and coat on your dog. It can be for short haired dogs with skin issues, a bath and deshed for high shedding dogs so there isn't as much hair around the house (important for allergy sufferers), and it prevents matting, debris, removes dirt and packed coat to help maintain proper temperature. Lastly it will keep your dog warmer in winter and cooler in summer. Please see chart below for a visual explanation. There are different programs designed to maintain your dogs skin and coat. Each dog requires its own maintenance program on a 4-8 week schedule. Please see below for explanations of different Maintenance Grooms. A "Full Groom" includes Bath, nails, ears, sanitary, and clip or style. A 'Bath & Brush" includes nails and ears . This is not dematting or deshedding. If it's for a special occassion you can choose any of the above . Time to smell sweet and look neat for a special occasion with a bath , brush and Pawdicure (nail cutting and nail polish), or any of the other options from the A La Carte Menu. Preventative maintenance grooming allows your groomer to see things you may not, such as ticks, lumps, bumps etc. Speak to me regarding the program. Let's provide the best care for your treasured pets. We do it for ourselves so let's do it for them too. 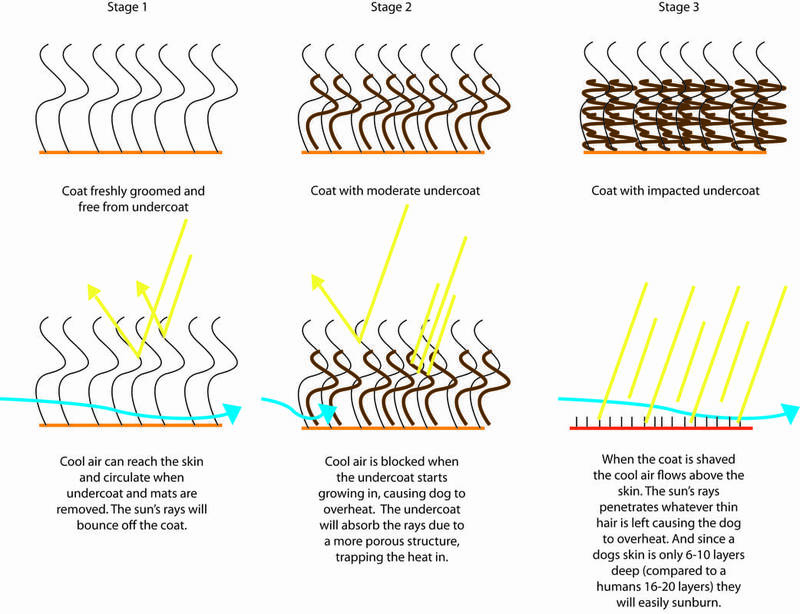 See chart below for a detailed picture of how the coat works.